New from Transducer Techniques an economically priced System combination comprising of our popular SWO (Universal / Tension or Compression) and our TMO-2 (Stand alone bench top amplifier / conditioner). This system is suitable for a variety of industrial and OEM force measurement and weighing applications. 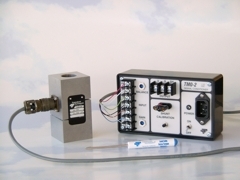 The TMO-2 provides excitation, balance and span adjustment via precision 10 turn pots, and shunt calibration. The SWO load cell is constructed from stainless and is offered in a variety of ranges from 1000 LBS. to 50K LBS. When applied as an inline load link or base mounted, the System SWO / TMO-2 offers good side load rejection. Accuracies are consistent with highly accurate strain gage based load cells. SWO Universal / Tension or Compression load cell and our TM0-2 Stand alone bench top amplifier.